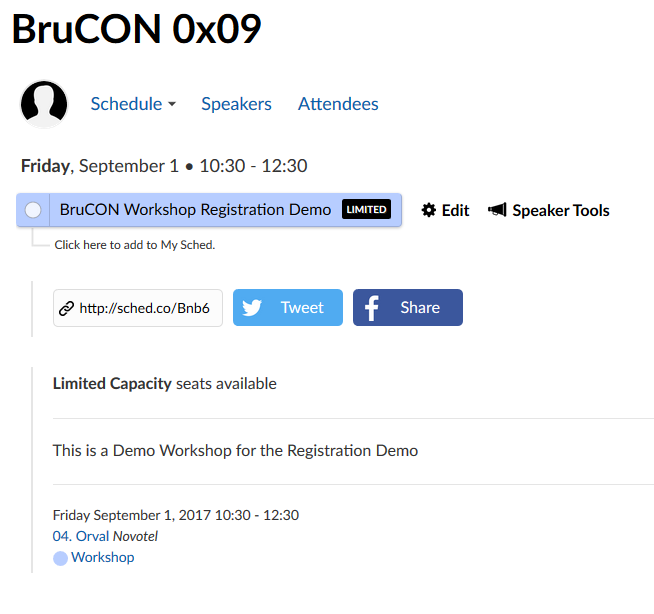 There are a few simple rules for the Workshop registration and participation at BruCON. 5 min before the official start time of the workshop, registrations are considered void, and the access is on a first come first served basis, up to the maximum capacity of the Workshop. In order for you to be able to register to a workshop, you will need a sched.com account. To do so, click on the “Sign Up” button located on the top right corner of the webpage. Note: The account you are about to create is on the sched.com website. This account is not affiliated or linked to the BruCON website. If you already have a sched.com account, you will need to be logged in with it to be able to register to a Workshop. The notable difference (a part from the “please login” message) is that little white circle next to each item. To register to a workshop, click on the small white circle on the left of any of the items. Congratulations! You have successfully registered yourself to a workshop. Note2: You can also register by directly clicking on the little white circle on the left of an item from the main page. In order to cancel your registration to a workshop, click on the small black circle with the white checkmark in it. Once it turned back into a white circle, this mean you have cancel your registration to the workshop. What if the workshop is full? If the maximum number of participant to a workshop have registered, you will no longer be able to register to the workshop. However, there is still a possibility for a spot to free itself on the day of the workshop. Reminder: A registration garanties your access to the workshop up till 5 minutes before the workshop official start time. If you arrive later than that, you will lose your reservation, and any person present at the entrance will be given your spot in a first come first serve basis. Do I need to have a sched.com account to register to workshops? Yes. We are using the sched.com services to make our list of participants, and it is only possible to register to a workshop when logged in with your sched.com account. 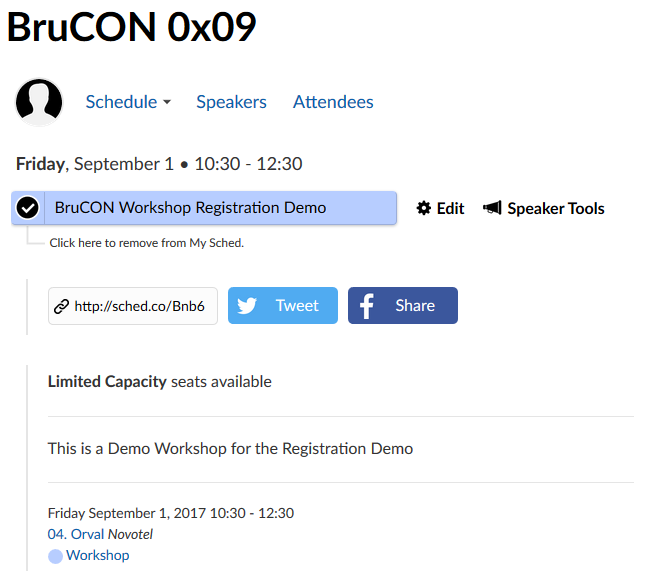 Do I need to have a sched.com account to attend BruCON? Do I need to be registered to a talk to see it? No. Registration is mandatory only for Workshops. Can I register to more than one workshop? Note: You will not be able to register to multiple workshops which occur in the same timeslot. Note2: please make sure you register only to the workshops you intend to follow. If I cancel my registration, can I re-register again later? Yes, this is possible. However, as the registration is a first come, first serve; if you cancel you registration, you will lose your slot. If no slots are available when you register again, you will no longer be able to register to the workshop.